We all do it: we buy an ingredient for the purposes of making one must-do, enticing recipe from this Sunday supplement or that. Said dish requires but a spoonful or two of said ingredient, and so the rest is left to fester in the back of the cupboard. Every so often it surfaces (have you noticed the almost volcanic activity inside most larders?) and you make a mental note to do something with it, and then it sinks out of sight again. Eventually you throw it away. Well there is totally no excuse for jettisoning your pomegranate paste. It manages, remarkably, to be exotic and useful all at the same time. 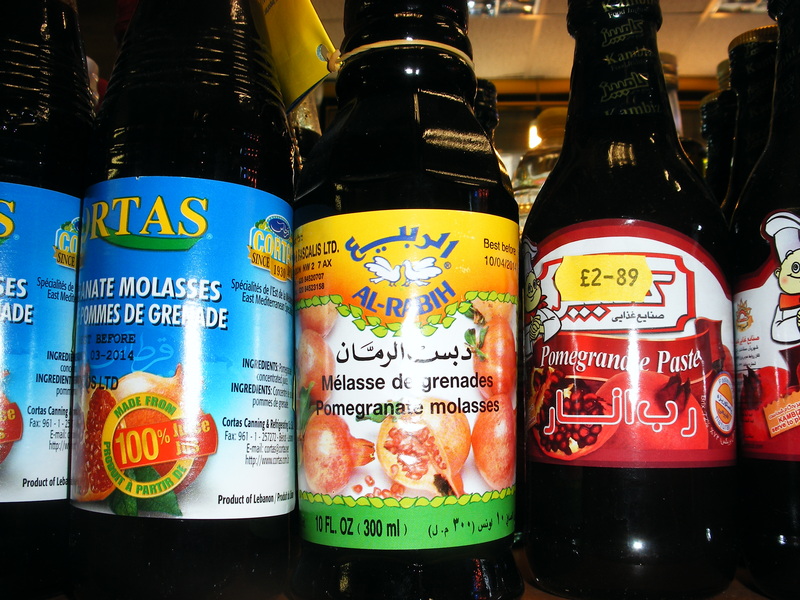 Firstly it should be pointed out that pom paste/molasses/ketchup are all the same thing, made from boiled down, concentrated pomegranate juice. Pomegranate paste is not the same as pomegranate syrup/cordial (aka grenadine), which is a thinner, sweetened product with other additives. Pom paste does vary from country to country: Arabshire tends to produce sweeter, redder paste, whilst the Iranian version is darker, thicker, sharper. This means that the Levantine brands (it’s called dibs al ruman in Arabic: look out for Cortas and Al Rabih as pictured above) are best used for lighter applications – salads etc., whilst the Iranian ones (‘rob anar‘ – look out for Kambiz, Namakin and 1 & 1) are better for serious sauce thickening and marinades. The product is also popular in Turkey, where it uses the alias nar suyu, and where the consistency and sharpness are somewhere between the Arabic and Persian versions. Khoresht-e-Fessenjun: this is a rich Persian casserole of ground walnuts and pom paste. It was traditionally made with duck, but works well with chicken, prawns, salmon…and vegetables. In fact, we will bring you the definitive veggie version in a post very soon. Promise. In a salad dressing. Here’s an easy-peasy option: whisk 1 1/2 tablespoons of pomegranate paste with 3 tablespoons olive oil, 1/2 teaspoon of English mustard, a squirt of lime juice and a big handful of crushed mint. Season to taste. As a ‘drizzle’ for oven-roasted veg. Mix with orange juice or tomato juice for a sweeter or more savoury effect. As a sauce for puddings. Make a basic syrup using 300g brown sugar/400ml water. Add 4 tbspns pom paste, juice + zest of 1 orange, + 1-2 tablespoons port. Warm gently. Great with baked fruit or steamed puds. As a marinade for the more receptive veg (aubergines, courgettes, marrow, mushrooms, cauliflower, beetroot, carrots): mix 3 tablespoons pom paste with 1 tablespoon sesame oil, 1 tablespoon soya sauce and 2 good teaspoons mustard. This also works well with salmon, chicken etc., should you be that way inclined. As a glaze: mix 2 tablespoons pom paste with 1 tablespoon olive oil, a knob of melted butter, 1/2 teaspoon ground ginger and some ground black pepper. Use as a glaze for roasting root veg, aubergines etc. In a cocktail. Oh yes. Although it is more traditionally pomegranate juice or grenadine that are used behind the bar, molasses give a drink a rich and exotic flavour that will keep your party guests guessing. Try mixing 1 measure gin with 1 1/2 tblspns pomegranate molasses, 1/2 measure of cointreau and a handful of crushed mint. Pour over crushed ice in a sugar-frosted glass and top up with orange juice. Let’s call it the Veggiegranate Gargleblaster. Because silly names rock our cocktail world. That should have your bottle of reddish gloop finished in no time. This entry was posted in Postcards from Veggiestan and tagged 1 & 1, Al Rabih, fessenjun, glazed veg, Kambiz, pomegranate molasses, pomegranate paste, Veggiegranate Gargleblaster, Veggiestan pantry, what to do with pomegranate molasses. Bookmark the permalink. I’d never thought to use pom paste in a cocktail before. I do like it as a dressing and marinade though. I’ll have to try out your “Veggiegranate Gargleblaster” recipe, haha! Well, can add to the list, I throw it in when I am making my take on the Georgian beetroot walnut dip, charkhlis pkhali (hope that is right). Anyway, I not only roast the beetroot with some balsamic pom vinegar but then add the molasses at the end and then everyone scoofs it. Plus have made cocktail with molasses, champagne and beetroot juice – inspired by my fav beetroot. Mmmm – pomegranate + beetroot. Thanks for that Roz! Can i take pomegranate paste straight up? is it harmful to have it direct?